A hen is a female chicken that is more than one-year-old and lays eggs. 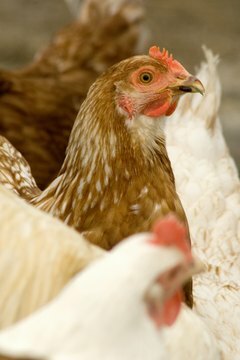 “Roost” means where the hen and other chickens get together and congregate at night, to sleep. Ideally, chickens, need a perch because they like to roost off the ground because this prevents external parasites from invading their bodies and keeps them from lying in their own droppings. You do not want chickens sleeping in the nesting box where eggs are laid. Chickens do not like to roost where they nest. When it starts to get dark, your hen and chickens will go back into their chicken coop to sleep. Chickens like to sleep at the highest point available so you need to provide a roost for them. Hens and chickens like to perch when they sleep. This makes them feel secure and it keeps them out of harm’s way since most predators are on the ground. The chickens sleep together on a roost for warmth and protection. When you install roosts, put them all at the same level, otherwise the chickens will fight for the highest roost. You can make a roost out of a 2 inch by 4 inch board. Smooth off the edges so the chickens don’t get splinters. Hang the board in the coop. The roost should be wide enough so that the chickens can comfortably put their feet on the board and not fall off. The roost should be at least 2 inches in width. Do not place the roost any lower than 18 inches from the ground. Chickens defecate a lot while they sleep. Don’t put the roost over the nesting boxing and don’t put the roost over the walking path to the nesting box because you want to avoid walking in chicken feces. The roost should provide 9 inches o 10 inches of board length for each chicken. If you have five chickens, the roost should be approximately 50 inches long. If the hen or chicken’s wings have been clipped they may require a ladder to get to the roost because they can’t fly. You’re probably heard the expression, “Who rules that roost?” which refers to the dominant or alpha entity in a chicken coop or a person’s home. Chickens have personalities just like people and there may be some skirmishes occasionally over territory. Where Do You Put Perches in Chicken Coops?